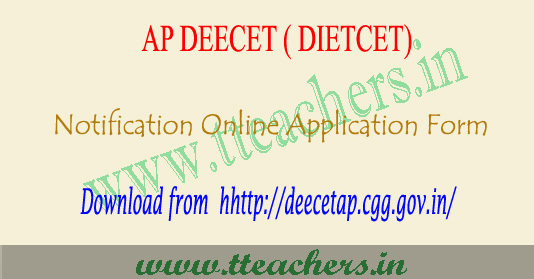 AP DEECET 2019 notification, ap dietcet ttc notification 2019 : Government of Andhra Pradesh School Education Department will be released soon of AP DIETCET notification 2019 for admission into Govt Education Training Institutes. DSE AP to be released ap deecet notification for Category-A seats (Convenor Quota) and applications are invited from candidates who intend to take admission into two year Diploma in Elementary Education (D.Ed.,) in Government District Institutes of Educational Training (DIETs) and Private Elementary Teacher Training Institutions in the state to be conducted by Department of School Education. Online application for DEECET - 2019 are invited from candidates who intend to take admission into two years Diploma in Elementary Education (D.EL.Ed) in Government District Institutes of Education & Training (DIETs) and Private Elementary Teacher Training Institutions in the state to be conducted by Dept. of School Education, Govt of A.P on May 2019 to May 2019 in all 13 Districts of the state of A.P. DEECET will be conducted on May 2019 to May 2019 in all 13 Districts of the state of A.P. The test will be conducted through online in 3 spells. DEECET shall be conducted in all the 13 Districts of the A.P state. Candidate can choose any District of his/her choice for online examination center. B. The candidate should satisfy Local / Non-Local Status requirement as laid down in the A.P. Educational Institutions (Regulation of admission) Order 1974 as subsequently amended. I. The candidate who passed or appeared for the 10 + 2 during 2018-19 final Examinations (Qualifying Examination) or its equivalent are eligible to appear for the entrance test . But, they should have passed the qualifying examination by the time of admission. Candidate belonging to “O.C” and “B.C” communities shall secure minimum 50% marks in DEECET. For Scheduled Caste, Scheduled Tribe and Physically Challenged candidates the minimum qualifying mark for allotment of seats reserved under the respective categories will be 45%.Thatis to say candidates belonging to SC and ST communities should secure 50% of marks for consideration against seats under OC / NCC / CAP / Sports category. 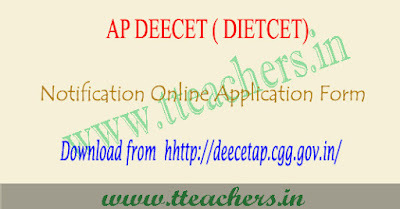 Candidates can download AP DEECET 2019 notification, ap dietcet ttc notification 2019, ap deecet notification 2019, ap ttc notification 2019, ap dietcet 2019 notification, online application form, apply last date by visiting the above link.